"Inside the ballroom Philippe Hoerle-Guggenheim and HG Contemporary erected an art installation featuring the work of contemporary French sculptor CÉVÉ." - Daily Front Row. 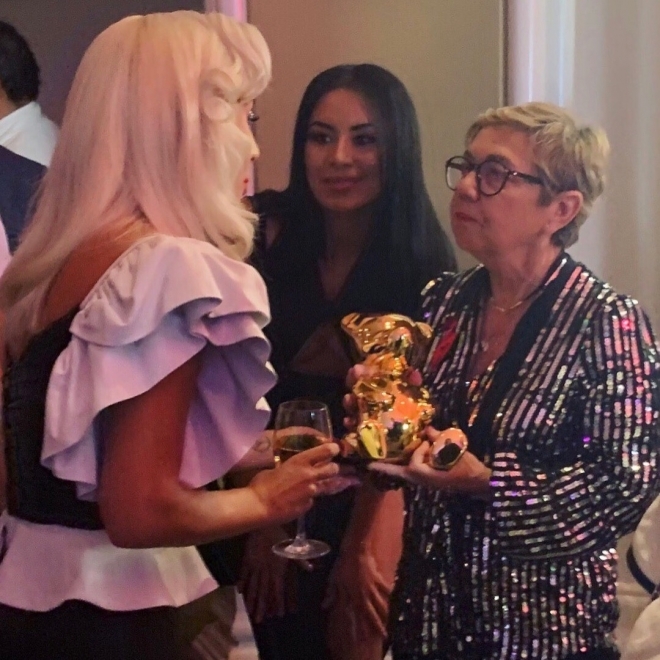 And Lady Gaga was so smitten by the works of the artist that she received one of them. Inside the Ballroom, Philippe Hoerle-Guggenheim and HG Contemporary erected an art installation featuring the work of contemporary French sculptor CÉVÉ. HG Contemporary is a global fine art gallery founded and curated by Philippe Hoerle-Guggenheim in the United States and Europe; cities New York, Madrid, Napa Valley and Brooklyn. Hoerle-Guggenheim has built a reputation for identifying and cultivating artists worldwide and producing shows that embrace groundbreaking aesthetics, concepts and visual expression. Hoerle-Guggenheim has an unparalleled eye for quality, combined with a distinct skill for nurturing and promoting new art. 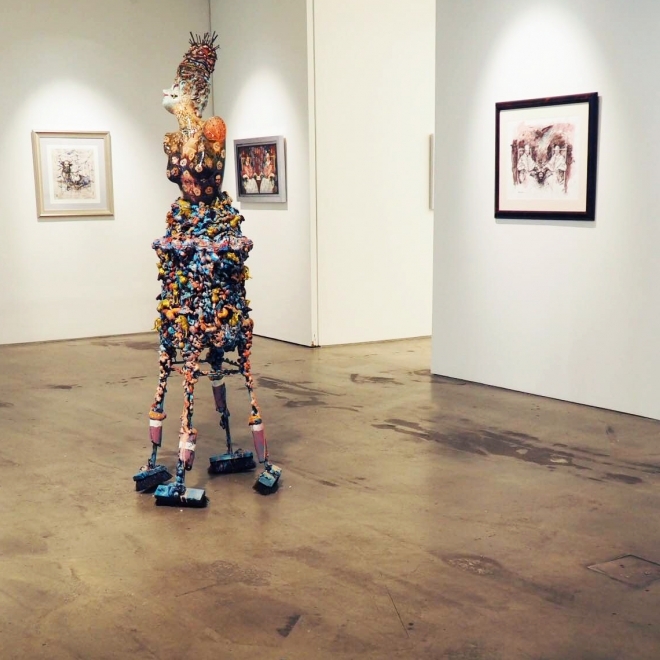 He exhibits both internationally and locally acclaimed artists whose processes and backgrounds are unique, diverse, and relevant. 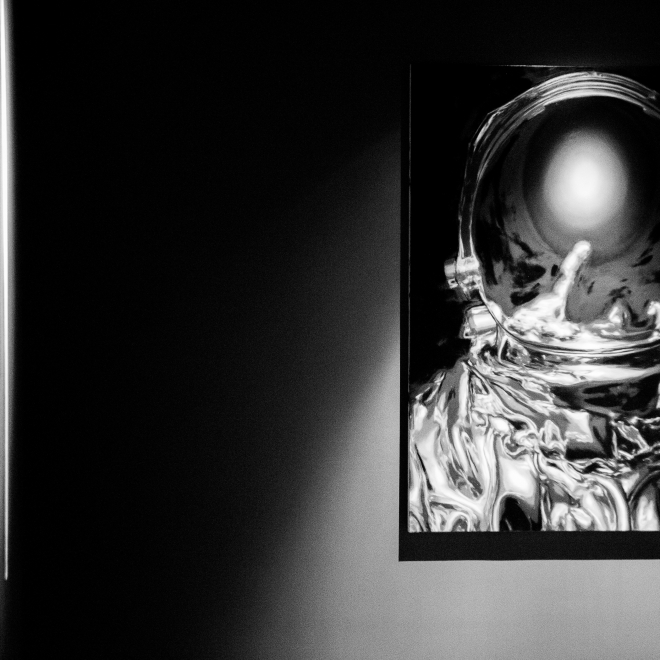 HG Contemporary prioritizes personal investigation and individual narratives with a mission to create value for art collectors and artists alike. 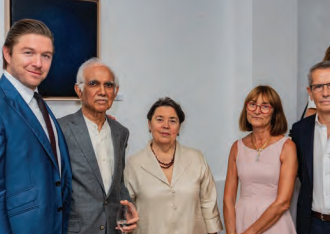 This commitment carries an innovative and clear vision about producing exceptional art exhibitions as well as a deep understanding of visual culture's function within and beyond the walls of the gallery. 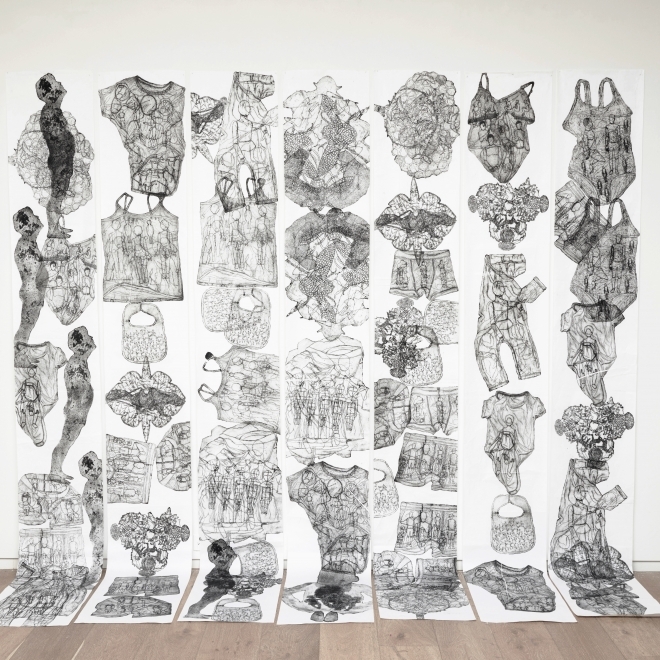 Mehwish Iqbal’s Mind, Body, State is an eclectic body of work that has evolved over a period of three years, in conjunction with her active engagement with women and children from refugee and migrant communities across Australia essentially influencing her art practice and thinking around the notion of home and belonging and mass migration globally. What does a Machine know about Mortality? 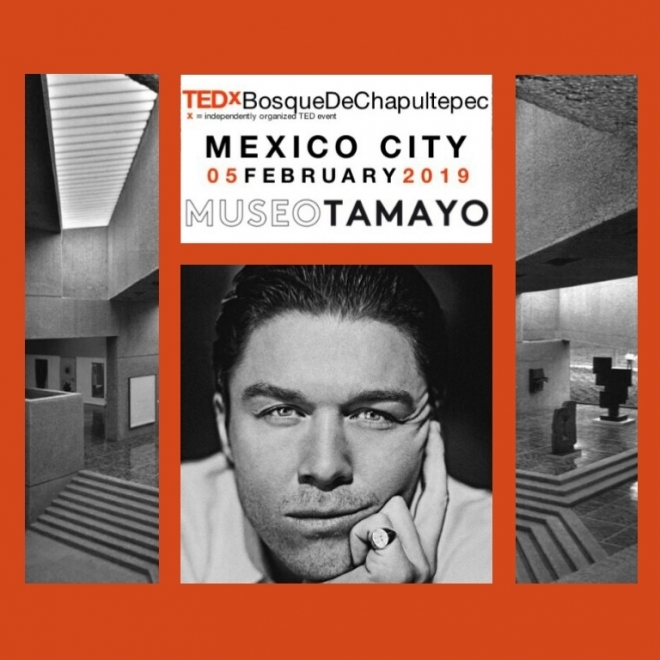 At the February 5th TEDx event in Mexico City, founder and owner of HG Contemporary Philippe Hoerle-Guggenheim will discuss the expansion of the gallery and its forthcoming ventures. HG Contemporary proudly presents Salvador Dalí, to commemorate the master's 30th year anniversary. 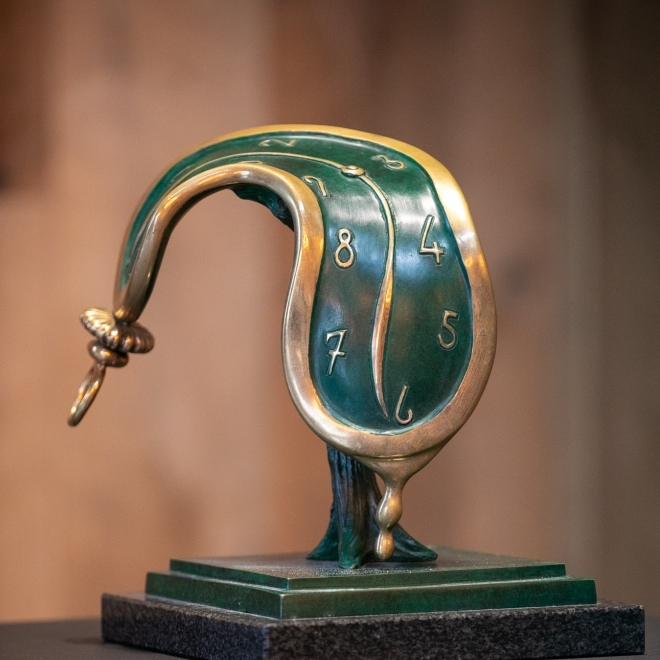 A carefully selected body of work, amongst them will be rare paintings, sculptures and also some editions exhibited with the intention to reveal an insight of Salvador Dalí’s genius, a window into the life and art of the greatest Master of Surrealism in modern history. This exhibition will allow visitors to delve into the genius mind of Dalí and to admire the infinite creativity of his lifetime imagination. Opening at the exclusive Brasswood Estate in St. Helena, Napa Valley. Art Basel kicks off next week and one of the most important faces on the scene is Philippe Hoerle-Guggenheim of HG Contemporary. 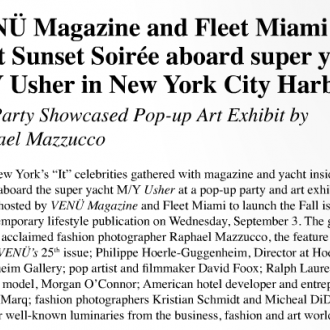 The Daily will be hosting a dinner with the renowned gallery owner at The Faena to kick off the fair, but first we thought we’d dig a little deeper with the name to know in the art world right now. Susan J. Barron’s beautiful and powerful 6x6ft mixed media depictions on canvas are achieved through photographic imagery, paint and text. Unflinchingly the veterans make direct eye contact with us. 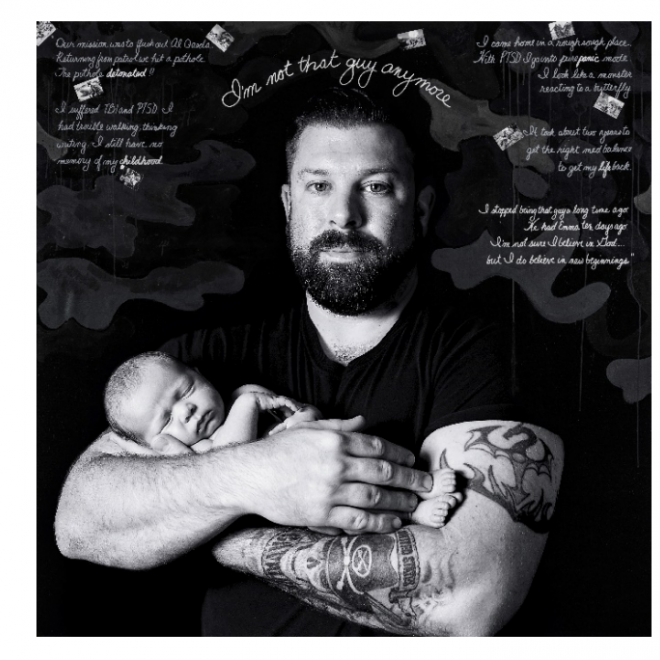 Incorporated into these photographic portraits are the veteran’s own stories in their own words. In these works, they give voice to their experience, their reality, their world. 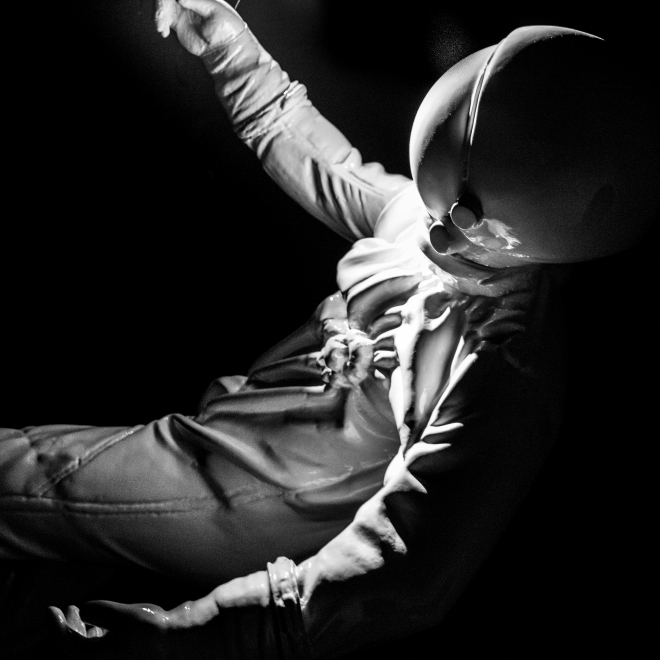 The elegance of the images confronts the brutality of the stories. Barron’s ultimate mission is not one of simplistic deification, but one of truthful illumination. This body of work is intended to not only give voice to these warriors’ harrowing, shocking, and often hopeful stories, but to create a dialogue and community around the difficult issue of PTSD. The mission is to depict the invisible scars of war and to show these brave individuals they are not alone. The mission is to end their isolation and depict them as the heroes they are. There will be a private gallery reception for veterans who graciously participated in the portrait series on Veterans Day, 2018. 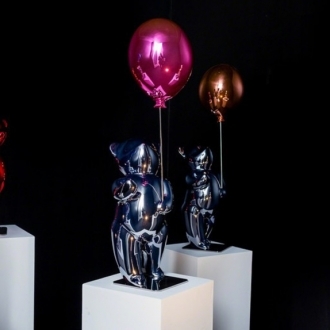 HG Contemporary is pleased to present the work of recognized French artist, CÉVÉ, her first solo exhibition in NYC, consisting of 9 series of limited edition sculptures entitled “Young Forever” inspired by the original creation “Teddy’s”, distinguished by their 5 different colors and 3 different sizes. All pieces have been meticulously designed and assembled in France. This collection merges CÉVÉ’s legacy of luxury French craftsmanship with the innocent touch of childhood. Generational figurehead of Chelsea’s Gallery District, Philippe Hoerle-Guggenheim keeps New York fresh and conscionable with a new show, “The Journey Is The Destination,” which will open the evening of September 6th, 2018 at HG Contemporary (527 W 23rd Street). 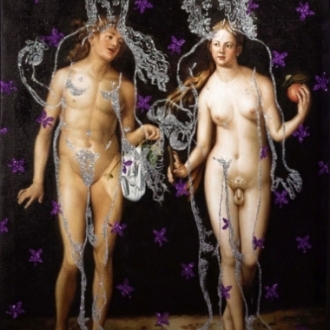 The exhibition illuminates a beauty inside the struggle, which is so often lost against a hunt for the next path to pleasure. 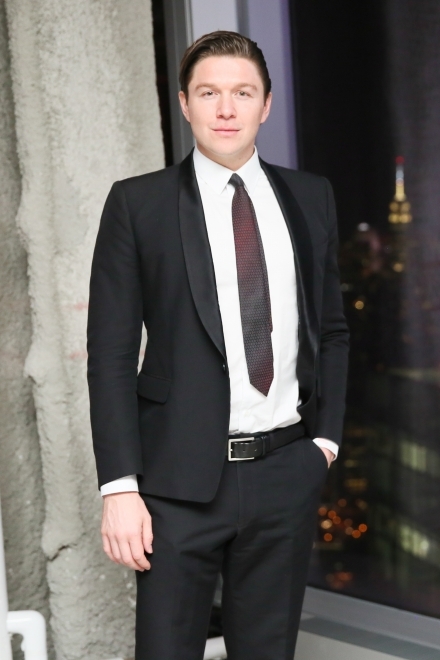 Philippe Hoerle-Guggenheim is a name to know when you’re looking for a gallerist who’s grasp on the art world knows no bounds. He has an ability to speak about art in a down to earth way and to use art to hone in on what anyone is looking for, a human connection. 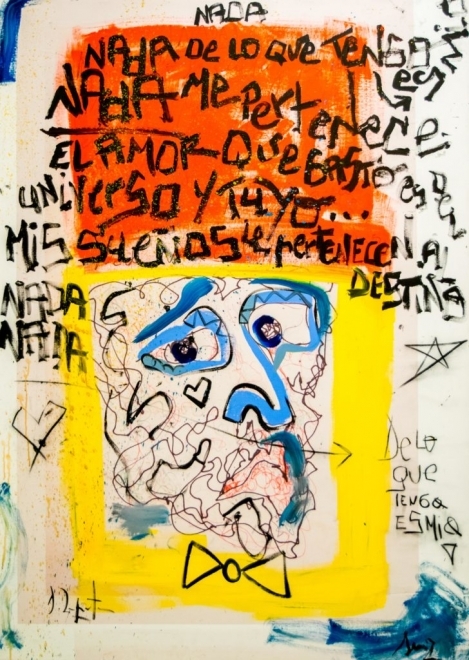 The Spanish artist known for his jet-setting lifestyle, collaborated with musician Alejandro Sanz to create a new body of paintings. 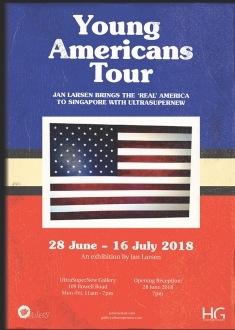 Featuring a show of colourful, cool, catchy Neo-Pop, American pop-sensation Jan Larsen captures the contemporary American experience in all its grit-and-glory. Philippe Hoerle Guggenheim, the owner of Hoerle-Guggenheim Contemporary, is known for producing shows that embrace groundbreaking aesthetics and concepts that are a little out there so it came as no surprise to me that Alejandro and Domingo come from different artistic backgrounds and disciplines. The exhibition, which was meant to be seen as a “super meeting of the minds,” and a collaboration that echoes the vibrancy and personality of artists like Picasso and Basquiat only reinforced the following: why don’t I know who Domingo Zapata is and how has this gallery attracted so many people in the middle of a heat wave during Frieze Week? Philippe Hoerle-Guggenheim has a famous last name that is synonymous with the art world. A distant relative to the Guggenheims who founded the museum of the same name in the United States, Philippe Hoerle-Guggenheim has cut out a path of his own. 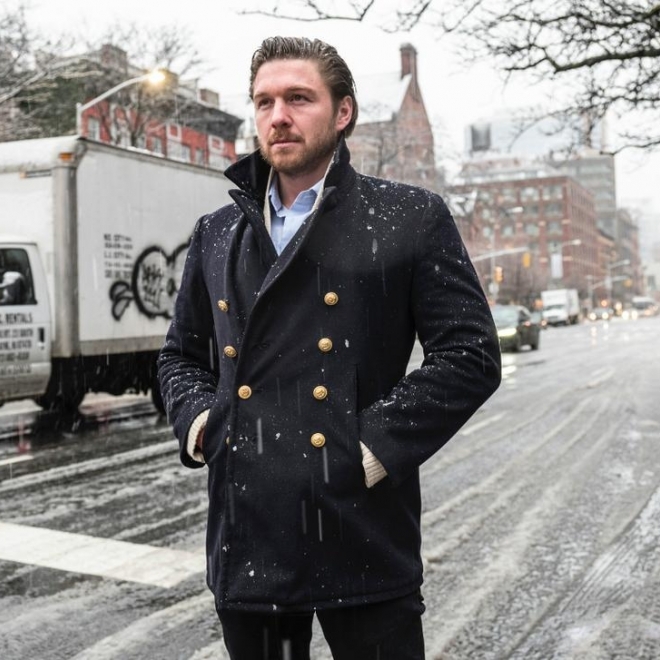 What this French-German living in New York City also has in common with the other Guggenheims is his passion for art. His love for the arts was developed at a young age. 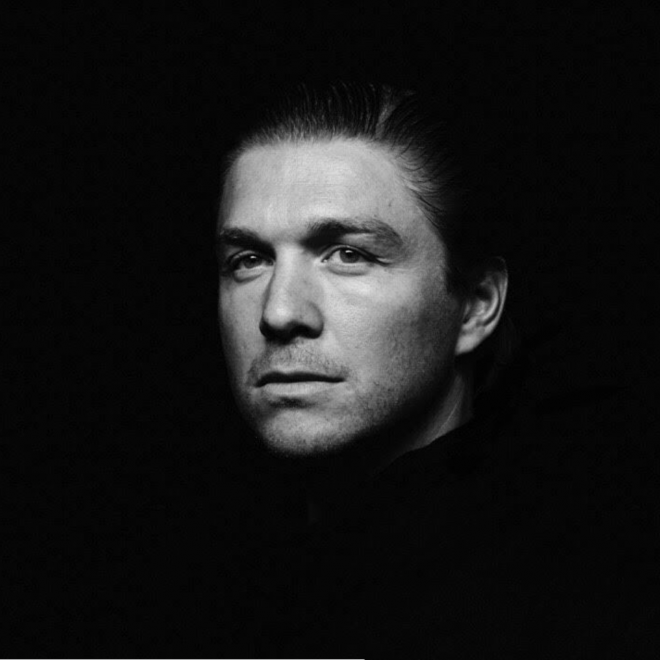 Inspired by his mother and grandmother, the German-born 36-year-old fell in love with art and those who create it. 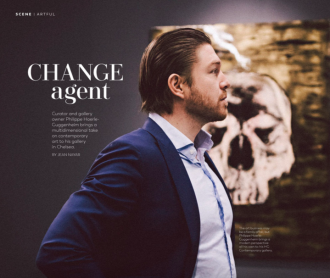 After spending time working in finance, he decided his true calling was to open the HG Contemporary Art Gallery in New York City. Hoerle-Guggenheim’s hip, cool and trendy art gallery shows off some of the best new artwork being created today by hot new artists. The Anglia Ruskin University graduate now sees his calling as a purveyor of the arts and has found his niche in the world. The HG Contemporary Art Gallery is thriving and Hoerle-Guggenheim couldn’t be more pleased with its potential as one of the upcoming art houses in New York City. The singer has inaugurated the show 'Smile', formed by thirty paintings painted in collaboration with the artist Domingo Zapata. 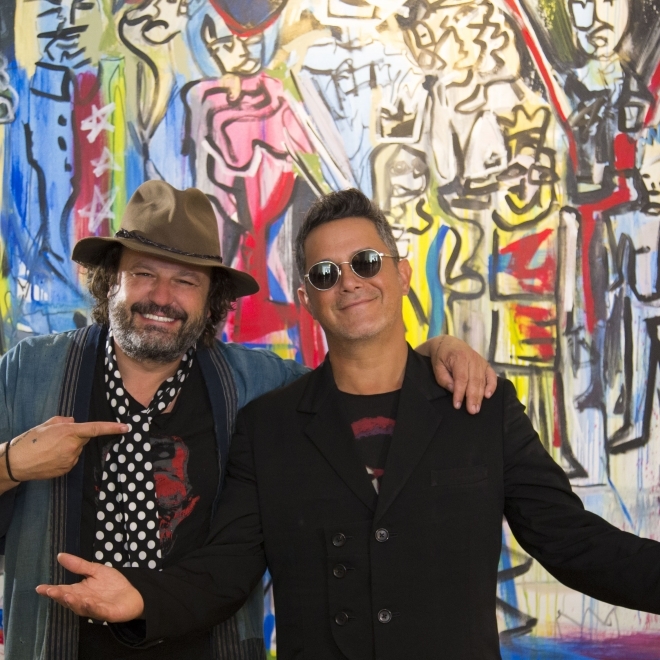 I had to choose between painting and music, things do not go half-way, I used to hang on a string before a canvas like a wall and I crashed against it with my paintings," Alejandro Sanz recently confessed to the agency. Efe . Although he finally opted for the world of music, this week he has taken up his more artistic side and has done it in style, with an exhibition nothing more and nothing less than in New York. A sample formed by thirty paintings painted in collaboration with the Mallorcan artist Domingo Zapata . Both have shown proud the result of their works, among which stands out one with a singular theme: the Royal Family. Chelsea space gallery owner of HG Contemporary, Philippe Hoerle-Guggenheim, takes to heart when he explains his decision to go for the Madrid singer Alejandro Sanz and the neo -impressionist Mallorcan artist Domingo Zapata , who has been in New York since 1999, with the exhibition 'Smile', which can be seen until May 15. 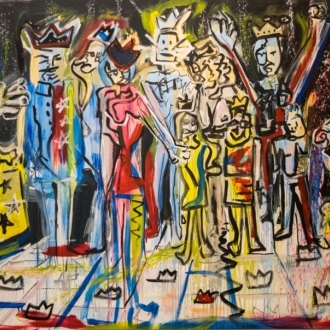 In the sample, highlights the pieces, made by Sanz and Zapata, with the title 'The withered flower', 'What I love About You' (What I love you) or 'The Royal Family' (The Royal Family), valued between $ 5,000 and $ 65,000 . Without a doubt, especially the last one, it is destined to attract the attention of the Spanish public, because it gives the impression that it portrays the tensions of the Spanish Royal Family . This joint exhibition is just another addition to a wildly popular and diverse career, this time exploring the world of music with renown musician Alejandro Sanz featuring Domingo Zapata. In 2017, Sanz received the Gold Medal of the Community of Madrid for his talent, his support of humanitarian causes and his ability to surmount obstacles. He has also received the Gold Medal for Merit in the Fine Arts granted by the Spanish Ministry of Culture, and the Vision Award bestowed by the White House through the Hispanic Heritage Foundation in recognition of his notable contributions to Latin music. A true renaissance man, Zapata has worked in everything from sculpture, painting, music, murals, and fashion. Born in Palma de Mallorca, Spain, Zapata splits his time between his studios in New York, Miami and Hollywood creating Neo-Expressionist paintings in both oil and acrylic with the incorporation of mixed media, collage and graffiti. 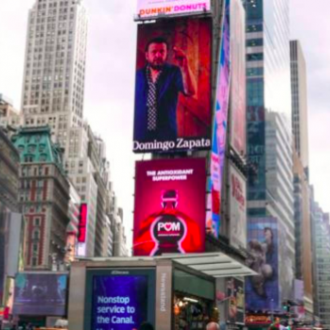 The Spanish artist based in Miami Domingo Zapata is the first one who manages to seize his art from a quoted advertising space on the giant screens of the iconic New York Times square , but he is sure that it will not be the last. Born in Mallorca 43 years ago, Zapata has been showing videos of 15 seconds each since last Friday and for two months on the central screens of Manhattan's One Tower , which are shown randomly in this building designed in 1904 by the architect Cyrus LW Eidlitz . While Philippe Hoerle-Guggenheim has always had a passion for art—he says that he began collecting as a child—it was not until later in life that he realized that art could be not only his passion but also his career. 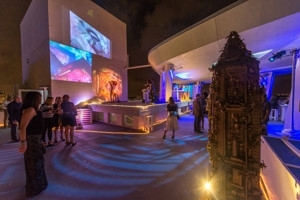 Inspired by the great artists and intellectuals of the 20th century, from Peggy Guggenheim and Pablo Picasso to Max Ernst and Jackson Pollock, who lived and breathed art in a social and communal setting, Hoerle-Guggenheim wanted to open a gallery to bring artists together and encourage people to connect and experience the feeling of living with art. Four years ago, that dream was realized with the opening of HG Contemporary. For art lovers and collectors: HG Contemporary Gallery presents first exhibition of painter Florian Crespol. For art lovers and collectors: HG Contemporary Gallery presented its first exhibition of painter Florian Crespol. 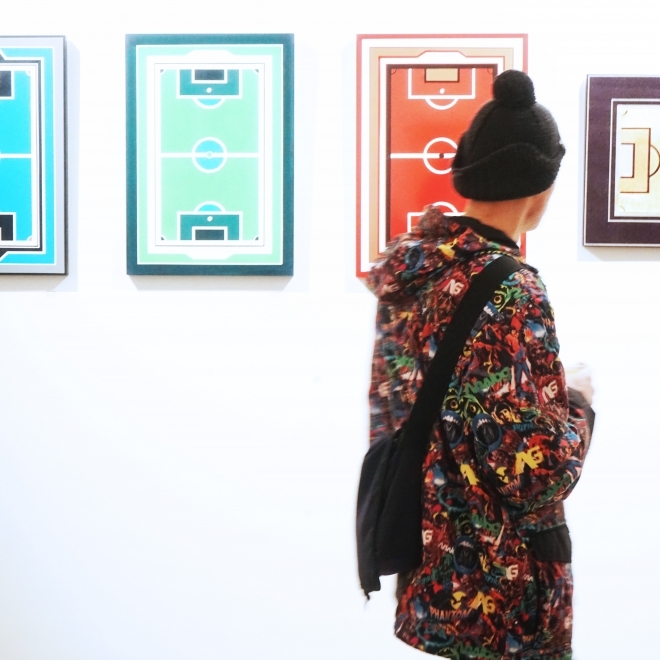 Entitled “Field of Thought”, the exhibition brings together different paintings on wood and PVC by Crespol, who actively explores societal obsession and professional sports. The exhibition will be on view through February 27th, 2018 at 527 West 23rd Street. 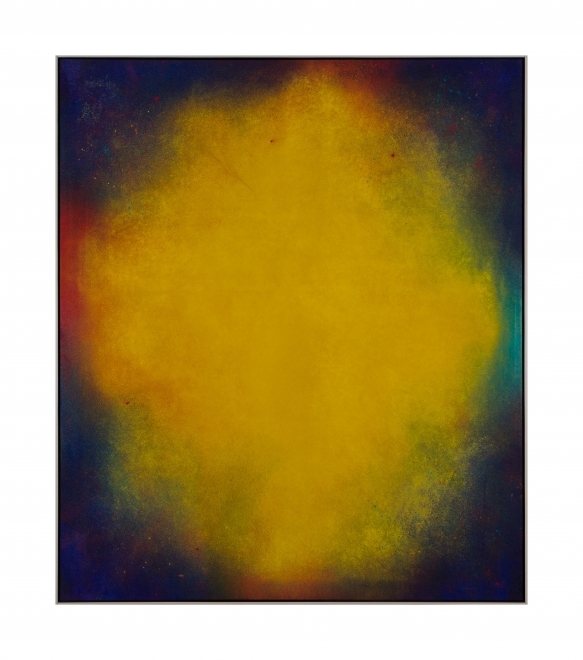 American-Italian painter Florian Crespol had a highly successful first exhibit of his series, “Field of Thought” at the HG Contemporary Gallery, at 527 West 23rd Street in New York City. The exhibit was launched with a private opening held on the evening of Feb. 7 and is scheduled to run through Feb. 25, 2018. HG Contemporary Gallery is pleased to present the gallery’s first exhibition for painter, Florian Crespol. 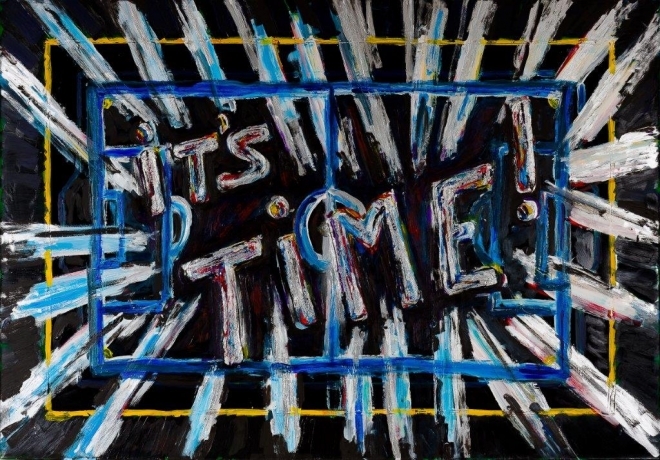 The exhibition entitled, “Field of Thought”, brings together different paintings on wood and PVC created by the artist who actively explores societal obsession with professional sports. Florian Crespol's first Exhibition entitled "Field of Thought" will be on view from February 7th - February 25th, 2018. Curator and gallery owner Philippe Hoerle-Guggenheim brings a multidimensional take on contemporary art to his gallery in Chelsea. 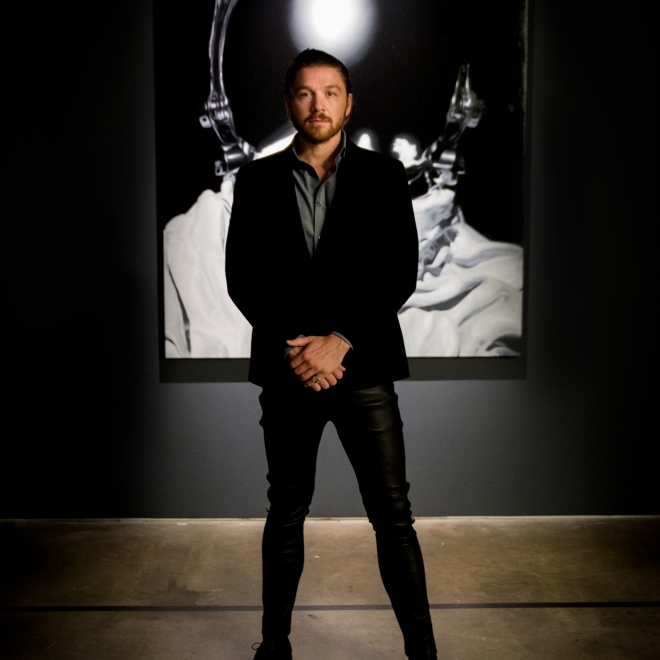 The art business may be a family affair, but Philippe Hoerle-Guggenheim brings a modern perspective all his own to his HG Contemporary gallery. Most people have a tendency to use one side of their brain more than the other. The right side of the brain excels in the arts and the left side of the brain excels in math and science. Those excelling in math and science usually have better job prospects with a better salary than those excelling in the arts. Few actually make it as a musician, actor or artist. They are called “starving artists” for a reason. 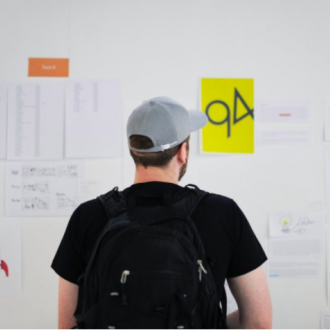 But what if you could get paid well for sharing your passion and knowledge with others? 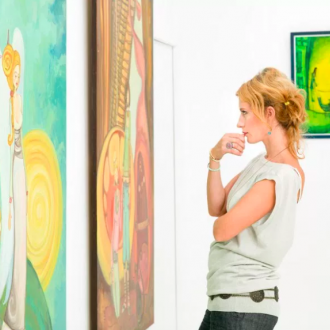 If you are passionate about art, you can turn that into a business through opening and running an art gallery. HG Contemporary, the breakthrough gallery founded by Philippe Hoerle-Guggenheim announced their plans during Art Basel week. 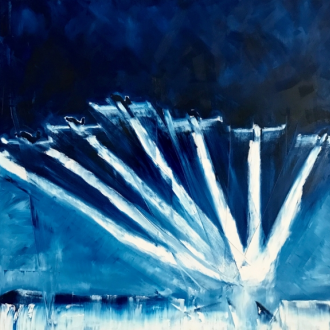 The gallery’s busy roster includes participation in Context and Aqua within the Art Miami fair and announced a new collaboration with innovation and art district, Lemon City Studios during the upcoming Art Basel week. Marriott International – an Official Partner of Art Basel in Miami Beach – to premiere StoryBooked™ during the art show. Produced by Marriott International's award-winning Creative and Content Studio – the documentary series captures the purposeful journeys of four emerging artists venturing to Japan, Italy, Spain and Peru seeking the ultimate in creative inspiration. Today’s Technology: Disconnection from Life? As the world became introduced to new technology, people were excited. They were told that it would save so much of their time that there would be more time for family, friends, and hobbies. Extensive research has proven that the opposite is true. We have become deceived about today’s technology. The truth is that computer and communication technology actually disconnects us from life. During the peak of Punk Rock in the early eighties, when questioning the status-quo and aggressive social commentaries were at the heart of artistic expression, the San Francisco based Punk/ska band The OFFS were working to build a career. The coverart for their First Record, illustrated by Jean Michel Basquiat originally intrigued their signing label and contributed to their brief success. The OFFS and Basquiat’s social commentaries were consistent -- a support for class struggle through political art. 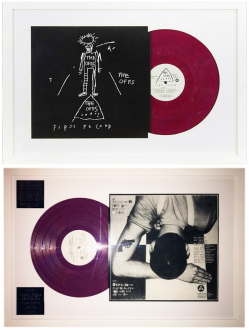 In 2017, HG Contemporary exclusively releases framed front/back limited edition of The OFFS First Record, cover art by Jean-Michel Basquiat. Philippe Hoerle-Guggenheim was featured in a live web-television segment with anchors Kristen Scholer and Alyssa Julya Smith. 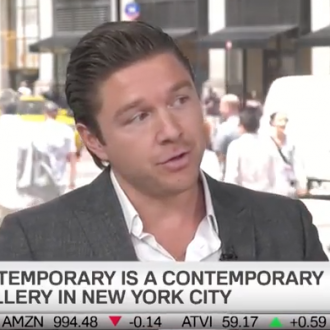 Philippe discussed art as an investment, specifically explaining how how fluctuations in economy affect art buyers, the kinds of artists he feel are currently most notable, how the digital-age affects the art sector, and more. Among 460 artists from 72 countries around the world, here are 5 artists to keep an eye on the art market. From the 6th to 15th of October 2017, Florence Biennale is hosting the eleventh edition of the celebraed art fair. The International Exhibition of Contemporary Art for twenty years has been as a showcase of excellence for world contemporary art. With more than half a million followers on Instagram and Facebook, young Tim Bengel is Germany's the most famous artist of his generation. 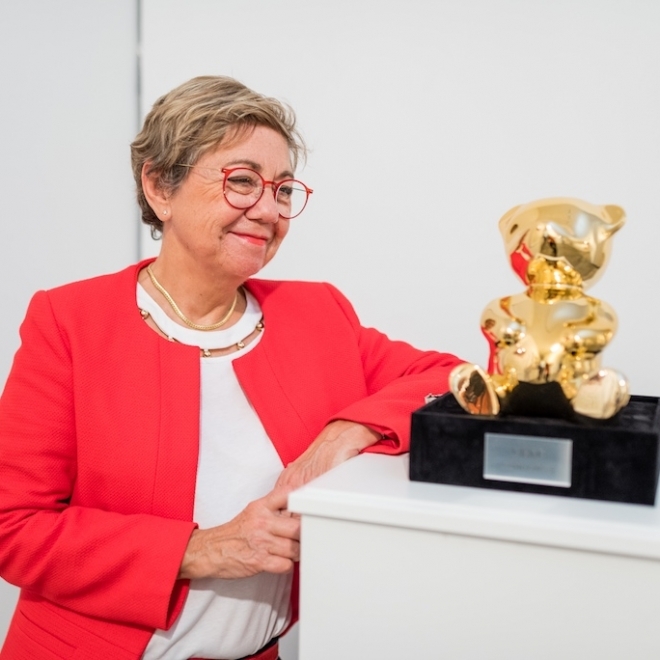 Being represented by a Guggenheim gallery in New York, the world-renowned artist is getting appreciation from New York to Abu Dhabi and Hong Kong. 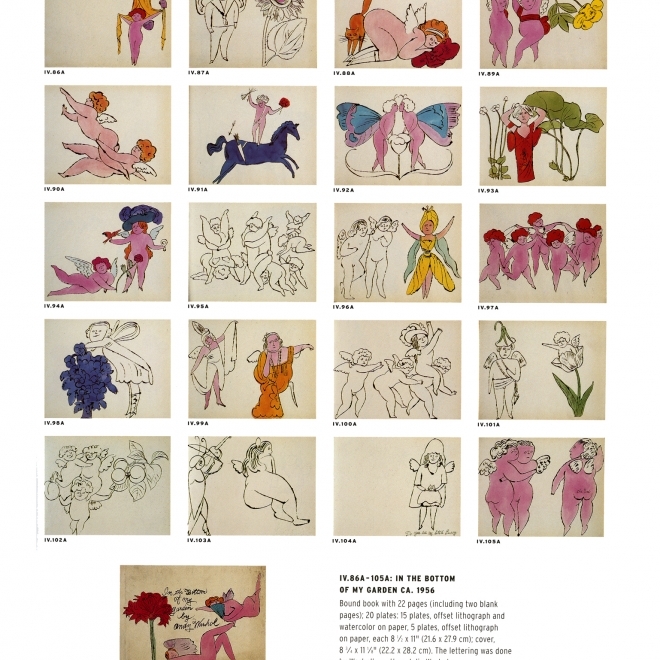 Bengel is the first artist the gallery has discovered online. "I found him on the Internet about a year and a half ago," gallery founder Philippe Hoerle-Guggenheim said shortly before the opening reception. 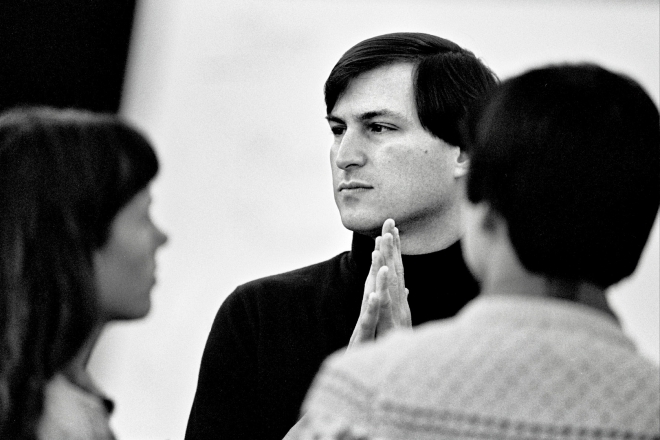 "I really saw true potential, both from the medium, and because there's that wow factor." 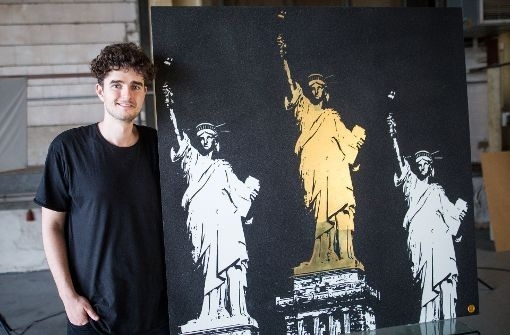 Tim Bengel has become somewhat of a YouTube sensation for the process videos featuring his unique technique of painting with sand and gold leaf. After tirelessly gluing individual grains of sand to blank canvases—each work can take up to 300 hours to complete—he reveals his intricate composition by standing up the canvas and letting the excess sand fall away, unveiling the image below. At the opening of his first New York solo show, the German artist will replicate this dramatic reveal live and in person for his newest piece. How many times in life one can say these words and really mean them? And then this German artist came along and left us speechless. Three times in my life I experienced feelings of this magnitude: when I saw Michael Jackson and Lenny Kravitz perform live and then on September 7th when the HG Contemporary Gallery lead by another German, groundbreaking gallerist Philippe Artus Hoerle-Guggenheim, hosted Tim Bengel’s very first international Solo Exhibition titled Monuments: My American Dream. 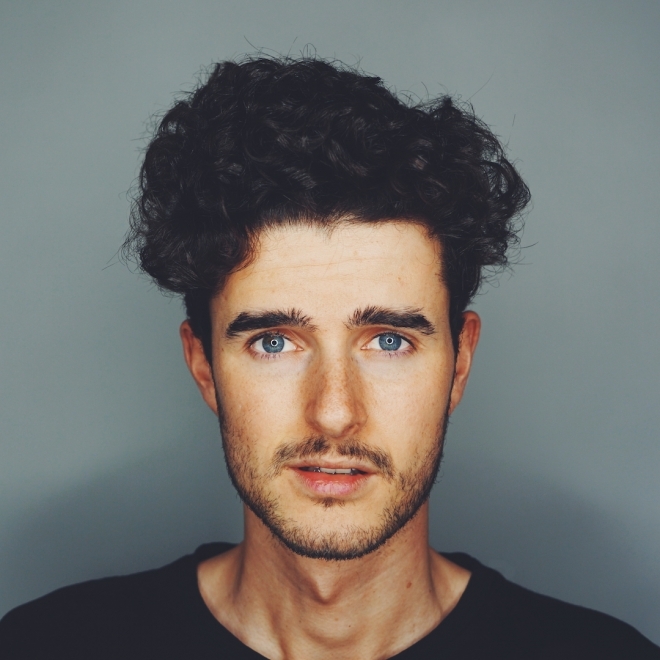 Tim Bengel is a German sand painter who has more than 500,000 fans on Facebook. His sand painting style is attracting everyone's attention on social media. 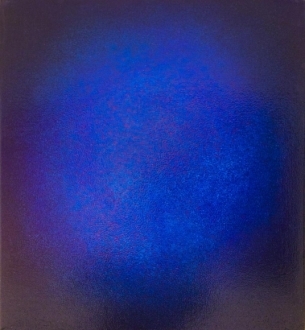 He currently has a solo exhibition at HG Contemporary Gallery in Chelsea, New York. 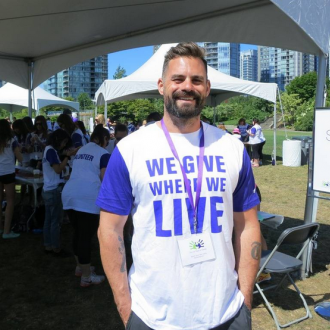 "The atmosphere here is very good, and I am very excited," he quoted. 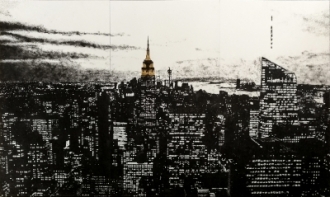 His exhibition is called "Monuments," a representation of the most iconic buildings of various countries. 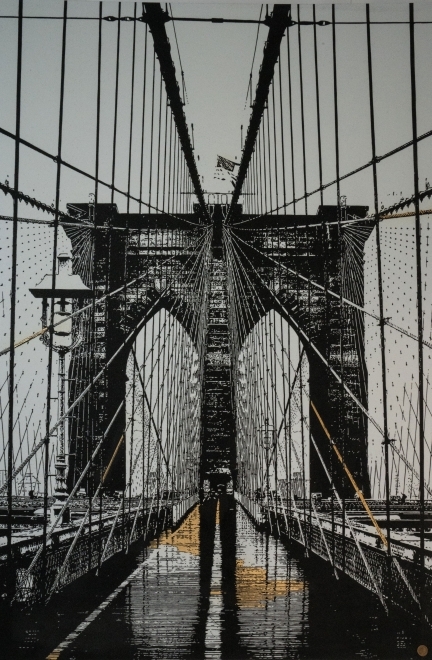 The artwork includes "Tribute to Andy Warhol," "The Winner Takes It All," "Brooklyn Bridge," and "American Dream." It is currently taking place until October 3rd. 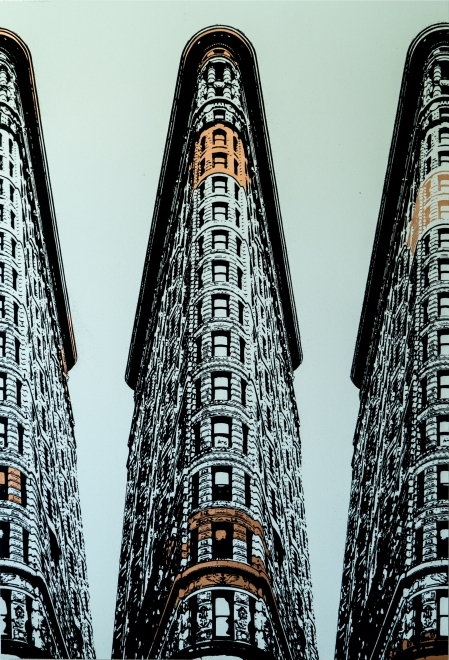 "I think it is interesting to bring life to buildings," the artist quoted. According to Tim, the most exciting moment in the process of creating an art piece is the reveal. 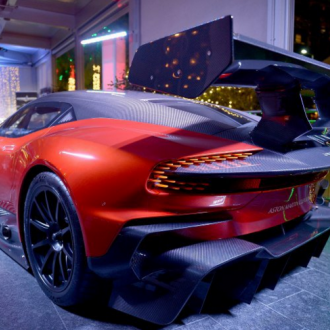 He has shared videos of his reveals on social media, accumulating more than 250 million views. How many people dread getting up early in the morning, think about their day, get their morning coffee and try not to dread going in to work? 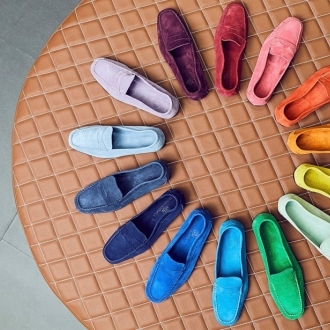 Unfortunately, most people spend the majority of their waking hours in this way. This dread drains their energy, which makes it more difficult to produce at work, which produces more dread. It is an endless and exhausting cycle. What if there was a way to end this cycle? 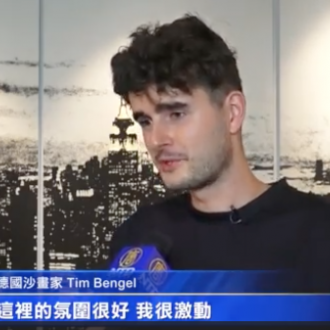 "Dream big" is the motto of Tim Bengel. This attitude will lead him him to New York in the autumn. 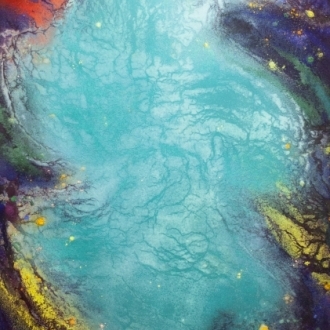 Before that, he is working with other young Stuttgart artists and shows his works in the boiler. 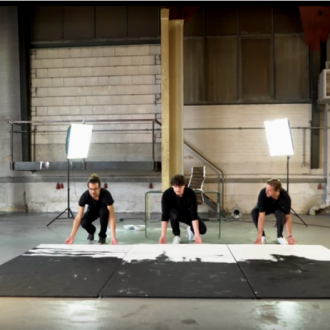 “For me art means doing things differently.” This tends to be the philosophy of the young artist Tim Bengel . This is the primary reason for his huge success. Oil on canvas, sculptures - all this already exists. That is why the 25-year-old has devoted himself to a different material that has a tradition in the art world, but is not so common today: sand. HG Contemporary, New York is hosting an exhibition of the works of artist Conor Mccreedy, on view through July 20, 2017. Represented by Philippe Hoerle-Guggenheim in North America, the show brings forth the highly acclaimed recent work by painter Conor Mccreedy (b.1987, Johannesburg, South Africa), who is known for his abstract and conceptual work based on his own unique, one-of-a-kind pigment “Mccreedy-Blue.” Inspired from his budding years in Southern Africa which is blessed with a landscape filled with endless shades of blue of brilliant cobalt skies and the convergence of Indian and Atlantic oceans, Mccreedy creates richly textured monochromatic abstract splash and figurative paintings in an unique pigment of blue. 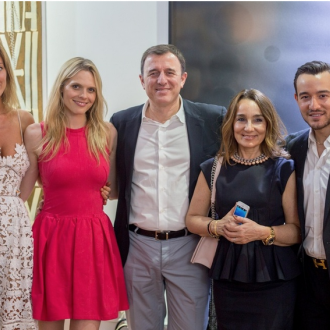 A new exhibition opening at Chelsea’s HG Contemporary Gallery last week. The main focus of the exhibition, which was curated by the gallery’s owner Philippe Hoerle-Guggenheim, will lay on the Greek artist Philip Tsiaras. Visitors will encounter a wide array of the acclaimed artist’s paintings and sculptures from the 1980s to present-day, which includes politically charged works, such as “Primtivist”. 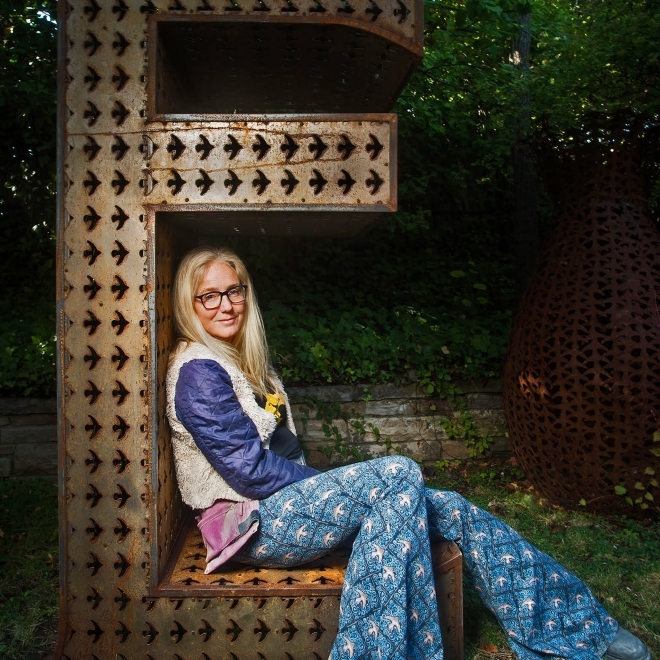 Acting as a visual commentary on gun-control, the sculpture asks an important question. Can anyone—no matter how primitive—acquire the right to use a gun? Produced by a Brussels-based creative consultancy Pro Materia, TLmag_True Living of Art & Design is published in both French and English. It is a print and online magazine dedicated to capturing and contextualising the latest innovations in craft-led art, architecture, curation, collector culture, design, fashion, hospitality, luxury, and urbanism. 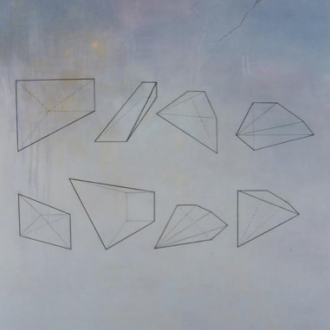 This was the magazine's feature on Laura Kimpton’s solo exhibition in HG Contemporary. The acrylic on canvas medium takes on a thoroughly new form here! That was my first, precise personal thought as I perused the exuberant work of Zhenya Xia at the prime Chelsea gallery – HG Contemporary (527 West 23rd Street) earlier this Spring. 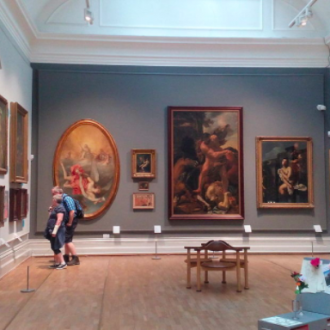 This is, indeed, art d’vivre – if there ever is such a definition. Such is the draw and the evoked emotion. Her grasp of color, and the subtle yet resonant depth of her layers, her shapes, her diagonals is all crisp, unorthodox and very much original. Without question, the artistic signature of this Zhejiang born Chinese artist will continue to gather the keen eye of the very smartest and most astute collectors of post-millennial contemporary art. 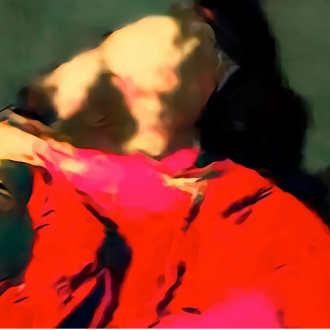 The artist’s latest solo show, “If Words Could Speak,” recently opened at Philippe Hoerle-Guggenheim’s gallery located in Manhattan’s Chelsea art district. 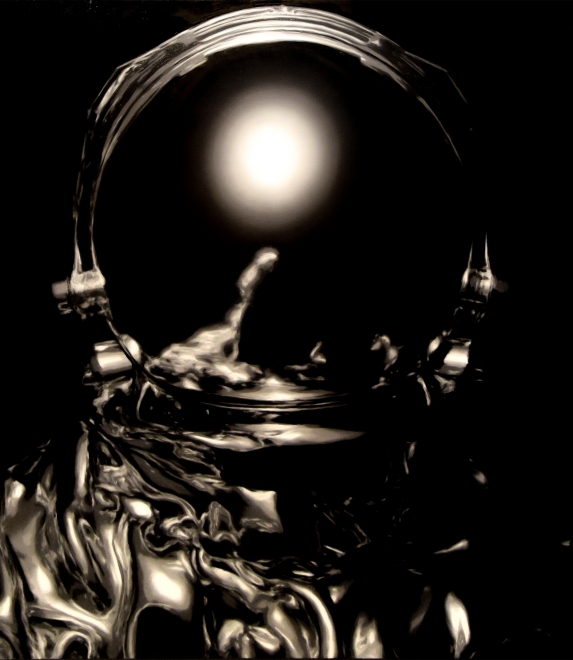 HG Contemporary presents a solo exhibition by multimedia artist Laura Kimpton. “If WORDS could SPEAK,” the title of the exhibition, considers the multivalent interpretations of words in text, speech, and sculpture, as they gain increasing importance through technology. 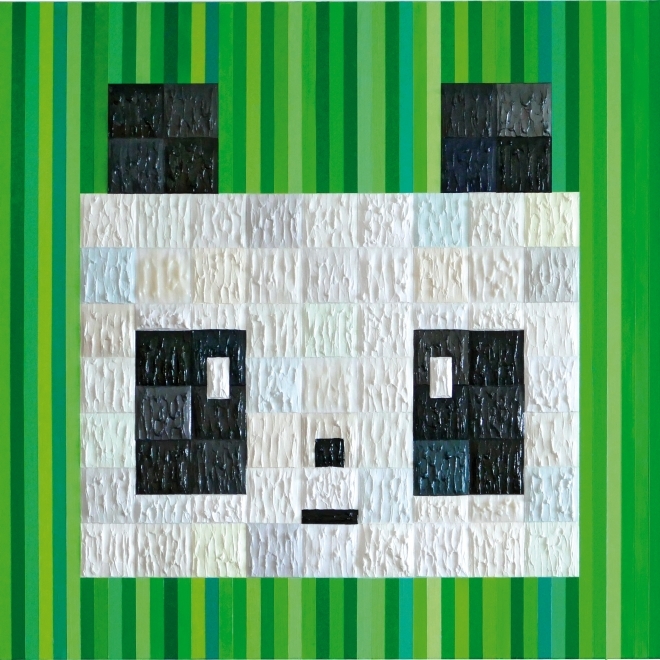 HG Contemporary will host artist Laura Kimpton’s solo exhibition from May 4 through May 26, 2017. The multimedia exhibition, called If WORDS could SPEAK, will focus on the importance of words within text, speech and sculpture. The China Press came by HG Contemporary's booth the first day of Art New York 2017 to see Zhenya Xia's collection of paintings and interview the artist. Her work was exclusively shown in the booth for the duration of the art fair. 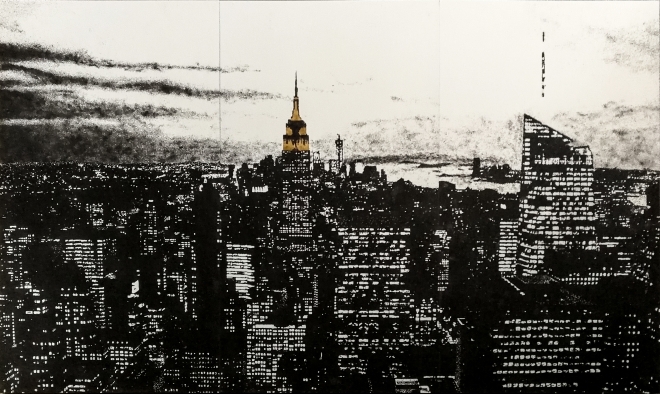 This fall, HG Contemporary will feature artist-sensation Tim Bengel’s first New York solo exhibition. Tim recently shared a video trailer for the New York show called “Do Things Different” which has received over 10 million social media views and thousands of shares internationally. 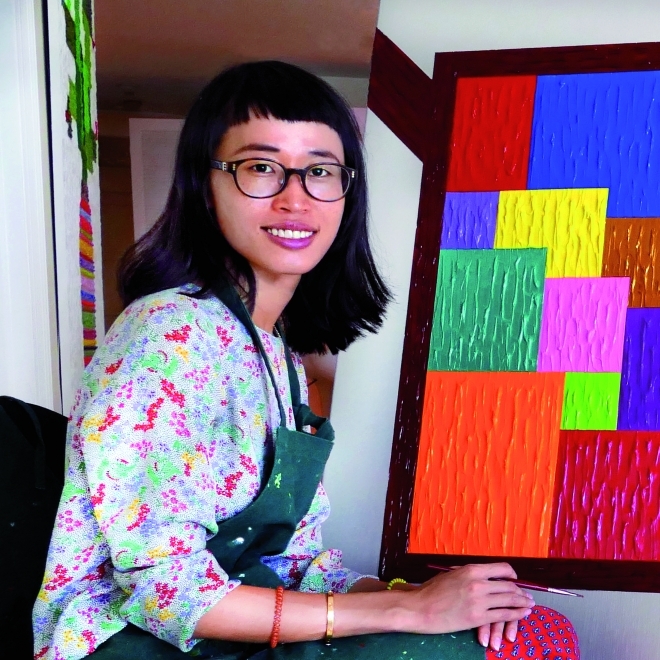 Philippe Hoerle-Guggenheim invites you to discover Zhenya Xia, a talented painter he discovered one year ago. Philippe Hoerle-Guggenheim bought his first piece of art, a Picasso sketch, at just 12 years old. 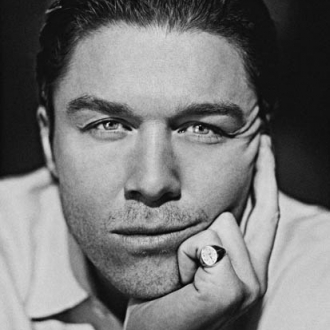 A native of Germany, he grew up in a family of collectors and artists and was always very intrigued by the art world. Still, he never thought he could make a career out of collecting. Popular culture has long revered The IT Girl. That particular intriguing, smart and beautiful gamine. The cool chick with style and substance and class and pedigree. Well, in this politically correct day and age, Simply put – the IT Boy is the masculine ideal that all men want to be, and the guy that all the women want to be with. We now seek to celebrate The IT Boy. Or in this case, this particular New York City man-about-town and the talk of Manhattan as we speak by the name of Philippe Hoerle-Guggenheim. Nelson Saiers is a ex-hedge fund manager who walked away from an extremely lucrative career in the banking industry to become a painter. "If I'm walking away from a hedge fund with my name on the door... I mean, I want to be an artist." Q. In his first exhibition stateside, what do you feel McAlpine Miller has to offer the US art scene? I think McAlpine Miller has a great deal to offer the US art scene. He is unique, the paintings are explosive, loud, yet at the time very refined; a symmetry between pop-art and fine art that is rarely seen. He brings a unique perspective to the art world. His work is complete and his style is very bold, both of which are refreshing for anyone viewing his art in the gallery. And last but not least, anything British is well received in the US and brings an underlining sense of sophistication with it. Last night, Miami Heat star athlete, Chris Bosh, was among the many art fanatics that came out to celebrate POWERHOUSE'S 1st annual Herradura cocktail party featuring works by acclaimed artist, Laura Kimpton of Philippe Hoerle-Guggenheim's HG Contemporary gallery. 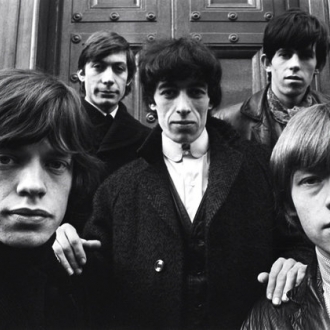 Ever dreamed of owning a piece of rock 'n' roll history? 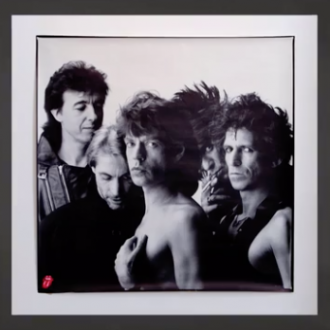 MICK, KEITH, CHARLIE & RONNIE: ART + OBJECTS, an exhibit opening on Nov. 3 at HG Contemporary Gallery in New York City, will feature rare memorabilia and art, created by or inspired by The Rolling Stones. As Donald Trump continues to hit the campaign trail ahead of the November 8 presidential election, it’s natural to expect him to make public appearances. Don’t be fooled by the planned presidential-style motorcade in New York at 1 p.m. on October 25, however: British artist Alison Jackson has enlisted a Trump impersonator for a pointed performance art piece. 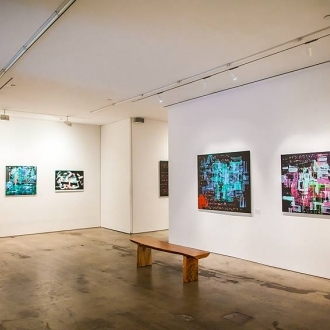 When HG Contemporary’s inaugural show is a solo exhibit of acclaimed street artist RETNA’s work, you know it’s a gallery with a distinct point of view. That guiding direction comes mainly from the Chelsea gallery’s director, Philippe Hoerle-Guggenheim, who has been visiting museums since he was three years old, getting carted around the Louvre with his art-obsessed mother and internalizing her penchant for the arts. 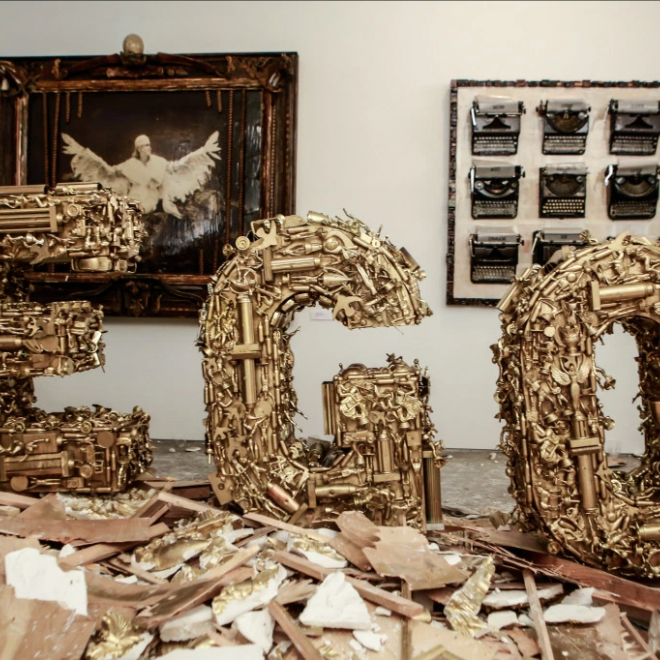 Hoerle-Guggenheim opened HG Contemporary in 2014 with the aforementioned RETNA exhibition to incredible acclaim. 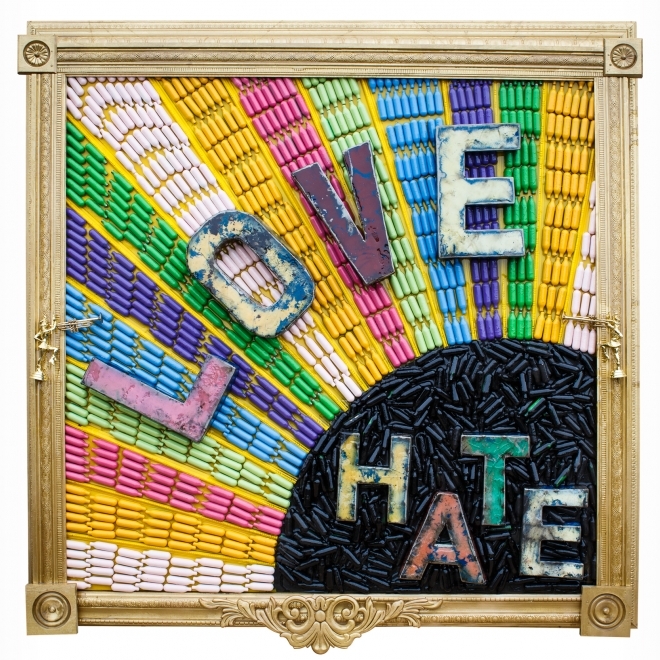 Since then, he has brought together an eclectic and thoughtful group of artists for a roster of group and solo exhibitions, often with a bold, playful pop culture bent that belies his genuine love for art. La HG Contemporary Gallery de Nueva York inaugurará el 16 de junio la exposición Más se perdió en Cuba del artista cubano Williams Carmona. El autor presentará una selección de piezas que incluyen escultura, pintura, dibujo e instalaciones, según informa la galería. Es la primera exposición en solitario del creador en esta galería. In New York’s Chelsea neighborhood, a growing crowd watches a mirror image of a common street scene. There’s a tow truck and a car, but instead of removing it from an illegal parking space, the truck is lowering it into place, on the sidewalk in front of HG Contemporary Gallery. It’s a late-model VW Beetle in black, but it’s a little hard to tell, because it’s barely recognizable under all the multicolored graffiti, the work of Nelson Saiers. 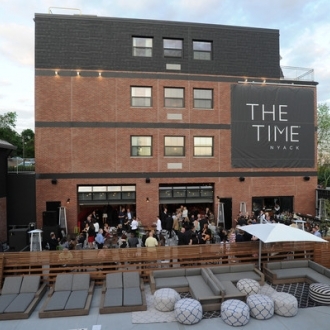 All of the art in The Time Nyack is curated by the HG Contemporary, founded by Philippe Hoerle-Guggenheim and specializing in bold, process-oriented work by emerging and established artists. 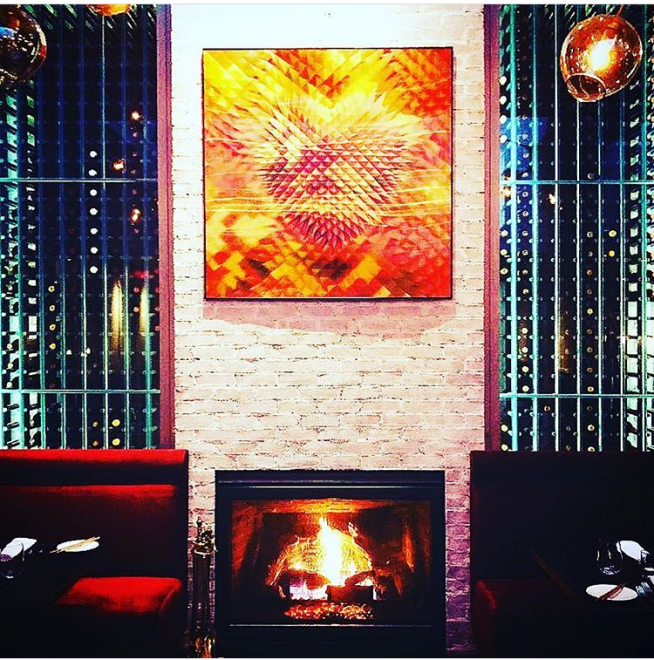 The artists featured specifically at The Time Nyack include Alexander Yulish, Raphael Mazzucco, Nelson Saiers, Russell Young, Maximilian Wiedemann, and Pixelpancho. Along with death and taxes, another certainty in life is math. In light of this, I hope to bring new meaning to April 15 as the birthday of Leonhard Euler. Born in 1707 to a pastor and pastor’s daughter in Basel, Switzerland, he was a devout Christian throughout his life, but chose the abacus over the cloth as a profession. 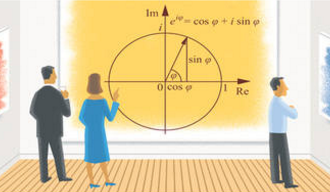 This career would produce three of the top 5 most important equations ever, including arguably the most beautiful (according to a 1988 Mathematical Intelligencer poll), leading many to believe him to be the greatest mathematician ever. It is even more remarkable that he was able to accomplish this with impaired vision for most of his life. 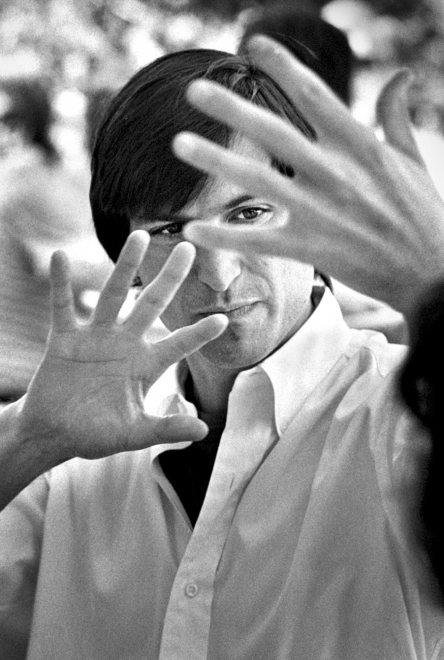 He began going blind in his 30’s, becoming completely blind in his 50’s. He actually became even more prolific after his blindness, earning comparisons to Beethoven whose deafness did not slow him. As an artist, I draw my inspiration from many sources, from the Ethiopian Civil War to the crossing of the Rubicon, from Cezanne to Shakespeare, but given my background in mathematics, I regularly find myself exploring the lenses and tools that mathematics affords us. As one of mathematics’ greatest innovators, Euler is one of these inspirations for me. Anyone familiar with the art world knows that there exists a complex, incestuous relationship between fine art and finance. Both deal in valuing things that can be hard to objectively appraise, and both can be confoundingly volatile. Plus, finance men, with their insatiable appetites for wealth and status, are flocking to art galleries and auctions these days. 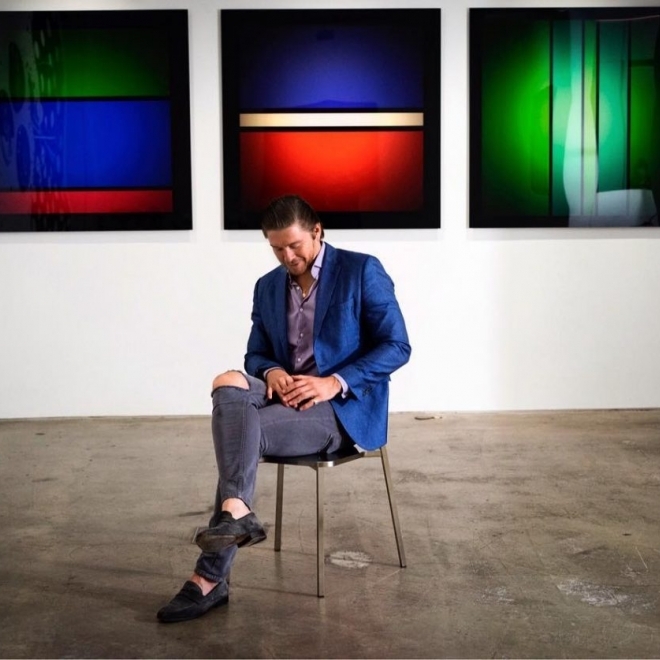 Nelson Saiers further unites the two: The former derivatives trader and hedge fund manager gave up his lucrative career to become an artist last year. He now paints—wait for it—financial crises. 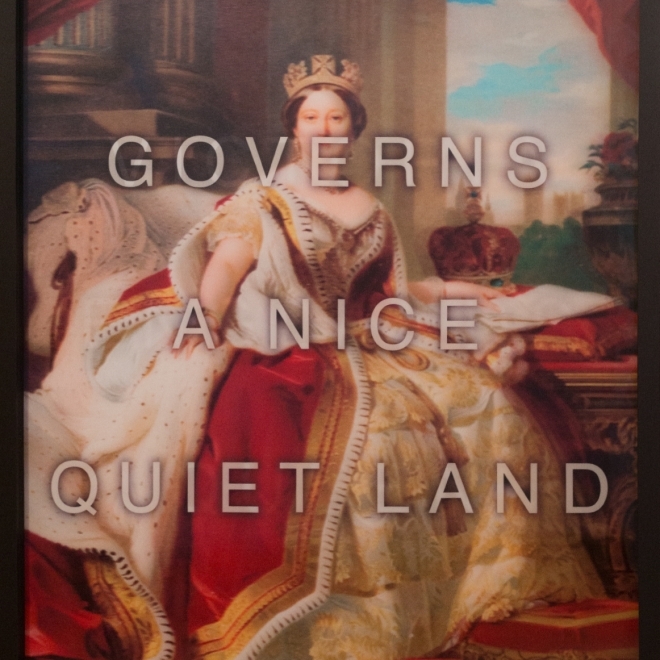 Two weeks ago his show of 20 paintings opened at HG Contemporary in Chelsea. The exhibition, suggestively titled “Inside Wall Street,” has a three-fold mission. 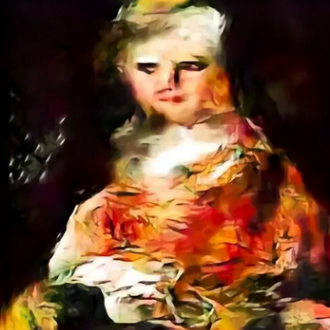 The works look at the inside of his algorithm (the intellectual property that built his hedge fund into a very successful one), the inside of his fund, which he wound down recently to focus exclusively on art, and inside Wall Street itself. 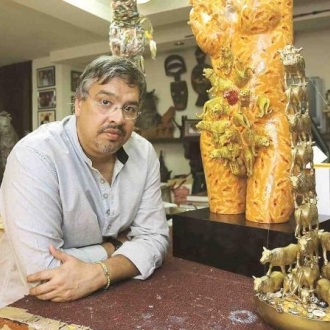 NEW YORK, April 15, 2016 (GLOBE NEWSWIRE) -- Nelson Saiers—artist, math Ph.D., and former hedge fund manager—walked away from Wall Street roughly a year ago. 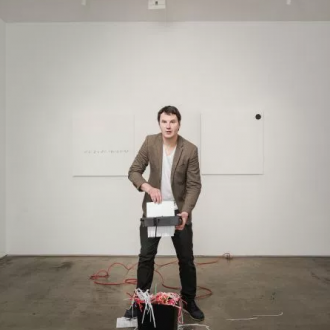 His art exhibition at HG Contemporary Gallery, 527 W 23rd Street in New York City, uses parts of his actual hedge fund trading algorithm to comment on the Financial Crisis of 2008, Madoff, and other large-scale financial motivators and events. Art and mathematics may seem worlds apart, but to study forms, lines, and shapes is also an education in balance, precision, and geometry. Harmony between the aesthetic and the abacus goes on display this week in New York at a show of former hedge fund manager Nelson Saiers’ art. Saiers left his perch in 2014 as a star quant to dedicate time to math-based art, and his show targets the chaos inherent in financial markets. Lessons gleaned from trading are ubiquitous themes in his paintings and sculpture. At times, he converts his money-making equations into splashes of Braille, inserting brooding commentaries straight onto canvas. 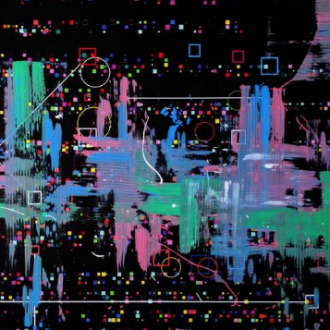 In one painting, he deploys his trading algorithms to conjecture what might have happened to the CBOE Volatility Index—the so-called fear gauge—after the assassination of Archduke Franz Ferdinand of Austria in 1914. 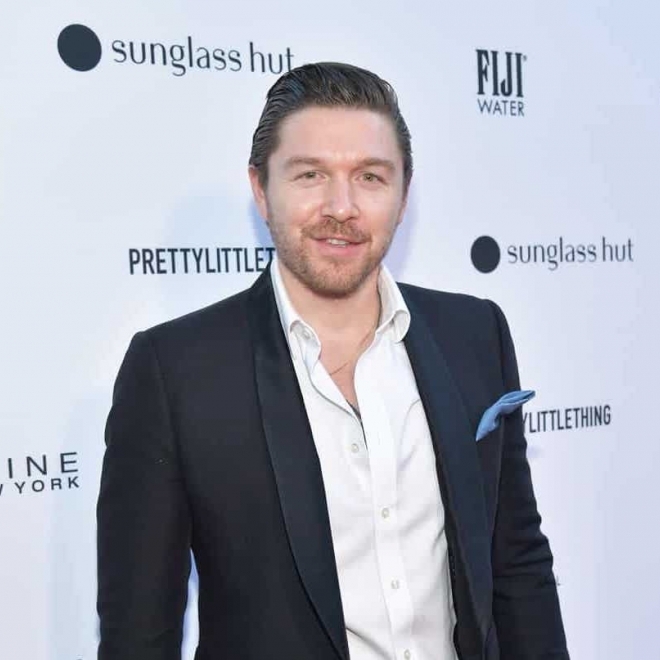 Haute Living hosted combined two popular Art Basel concepts – the talk and the dinner to great effect on Tuesday night at Tamarina Miami in Brickell. 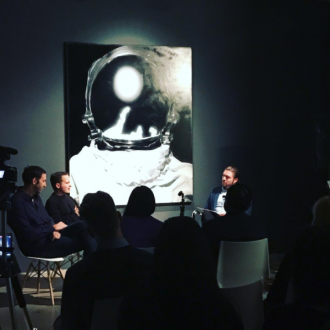 Philippe Hoerle-Guggenheim lead a discussion about the intersection of art and luxury brands, a perfect subject considering that Miami Art Week has evolved into the ultimate branding opportunity for the world’s luxury houses. It's the sort of outfit which would cause a scandal if Her Majesty wore it. Elizabeth Hurley - who plays a fictional Queen in E! 's spoof series The Royals - stepped out on Monday in a see-through lace top at the premiere of the second season in NYC. The 50-year-old model and actress defied her age in the black sheer top which showed off her fabulously fit figure. A true queen, on TV and IRL! Elizabeth Hurleystepped out to celebrate the second season premiere of The Royals on Monday, Nov. 9, at the Hoerle-Guggenheim Gallery in NYC, wearing a completely sheer, lace top that showcased her incredible body. 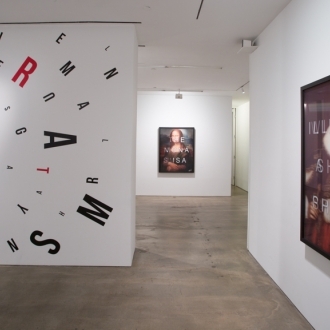 London-based artist Massimo Agostinelli's new show of work "Anagrams" is currently on view at Hoerle-Guggenheim gallery in New York (open through November 11). The Show includes works done with lenticular printing, so that names and phrases overlaid on imagery of pop culture icons transform as a viewer moves around them. On 27 October, Sotheby’s New York held a presale cocktail reception in anticipation of the night’s main event: Elephants Forever, an auction, in partnership with Maclaren, of 22 contemporary artworks. 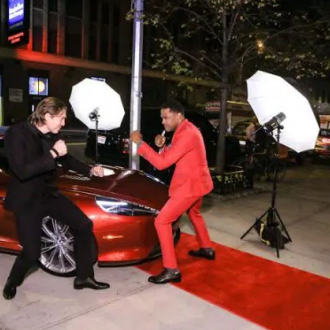 Hosted by Owen Wilson, the event raised more than $1 million to benefit two organizations: Elephant Family, dedicated to saving endangered Asian elephants, and Space for Giants, whose mission is to preserve open habitats for African elephants. 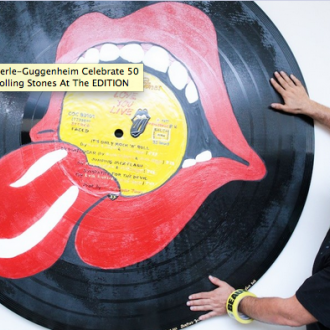 An exhibition of Rolling Stones-inspired artwork and memorabilia put on by the Hoerle-Guggenheim Gallery at the new Edition Hotel in New York on Tuesday night received over 1,000 RSVPs. The party was thrown in honor of the seminal rock outfit's 50th birthday, a fact that's enough to make pretty much anyone feel ancient. Like most high-profile events that reach capacity early, the scene at the door quickly devolved into bedlam. "A lot of them were turned away or forced to wait without ever getting in," an anonymous source told Page Six, which had the story. "It was a madhouse." 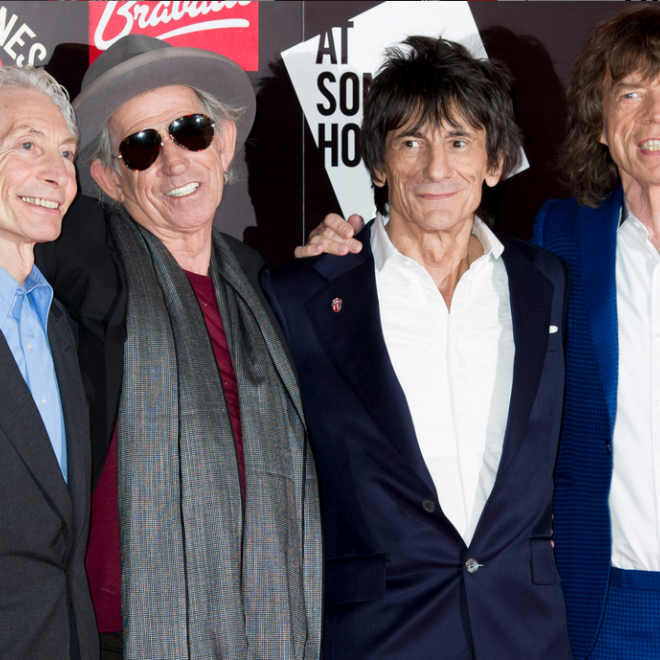 After serving over half a century as the best band in the world, the Rolling Stones are still the source of inspiration and entertainment for several generations. Last night that came in the form of a new art show presented by Hoerle-Guggenheim and WhitewallMagazine, in which the venerated band was again immortalized through a collection of paintings, hand-written lyrics, and even guitars that have lived more than most people. 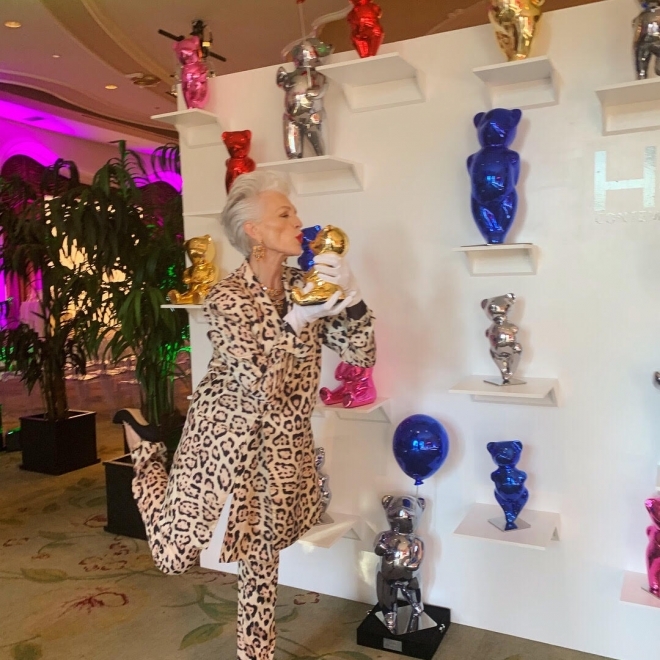 The collection, which included pieces by Rolling Stones guitarist Ronnie Wood, was spread out over the third floor of the ever-buzzing EDITION hotel, but it was still a challenge to get a good look at the work with so many guests filling up the large space. 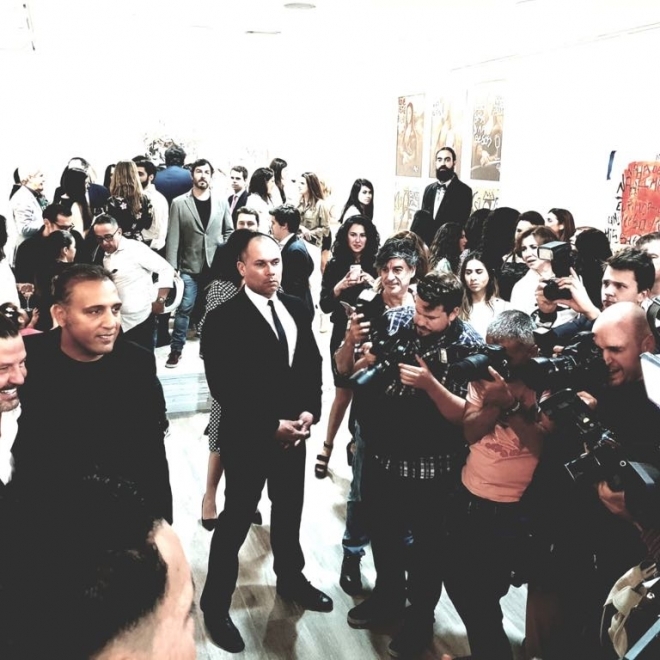 A long line formed outside the hotel, with people eager to get a peek at the show, but also to rub shoulders with the stylish guests including Mr. Brainwash, Harif Guzman, and the EDITION's very dapper Ben Pundole. Some of these may be painted black. 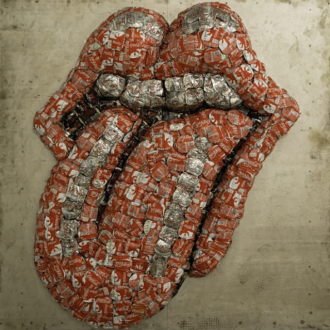 Works by artists including Rolling Stones guitarist Ronnie Wood will highlight the New York Edition and Hoerle-Guggenheim Gallery’s “Celebrating Over 50 Years of History” exhibit featuring art that was inspired by the Rolling Stones. The exhibit will be featured at the New York Edition on Madison Ave., Tuesday night. Other artists on display include Geronimo aka Jumping Bull, Ian Wright and Russell Young. 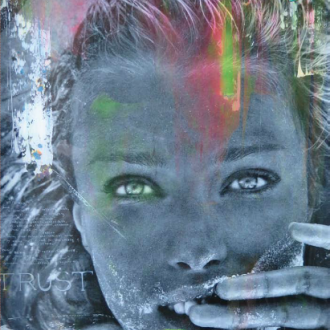 Mr. Brainwash (aka Thierry Guetta) is many things: a street artist, a filmmaker, and a real estate investor. He's been rumored to be Banksy, or alternatively, an invention of the famously anonymous street artist, after starring in the 2008 film, Exit from the Gift Shop. 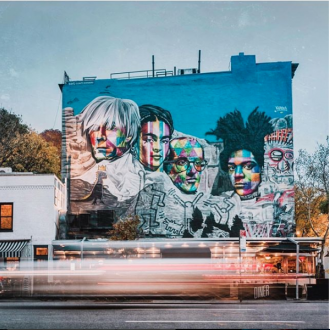 Despite, or because of, these rumors, Mr. Brainwash continues his work as a street artist, taking on projects in cities around the world. New York seems to be a special place for the French expat, who currently lives in Los Angeles, but just bought a space under the High Line. He recently teamed up with Hoerle-Guggenheim Gallery (see artnet Asks: Philippe Hoerle-Guggenheim, Gallery Director) to unleash his creativity on the interior of the newly launched New York Edition Hotel. The only problem? He has a mere three hours to get the job done, and isn't sure yet what to do, exactly. We sat down with Mr. Brainwash to discuss the project, his celebrity fascination, and of course, Banksy. 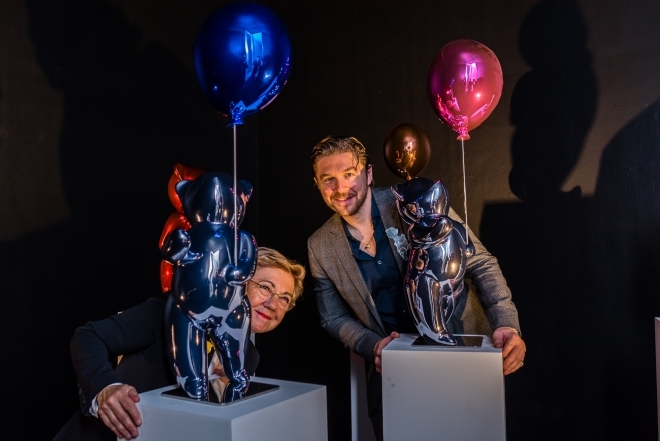 Luxury real estate firm, RLTY NYC celebrated the grand opening of its SoHo office at 518 Broadway on Monday, May 11th with an unprecedented collection of artwork curated by Hoerle-Guggenheim Gallery. 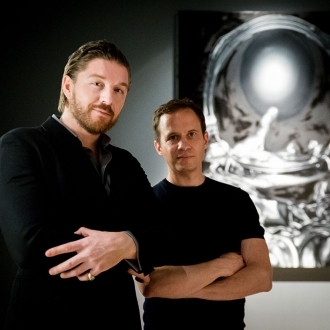 The company also disclosed its partnership with the gallery to provide fine art advisory services to its premier clientele. "Guns have long had an extraordinary and terrible influence over us," artist McCrow writes on his website. "There are those who glorify them, those that subjugate through them and those who suffer by them." This connection between man and weapon serves as the focal point of his most recent exhibition, "History Interrupted, The Art of Disarmament” at the Hoerle-Guggenheim Gallery. The show puts on view a collection of 20 decommissioned AK47s and other small arms, collected from regions of conflict around the world -- the Democratic Republic of Congo, the Palestinian territories, Iraq. McCrow renders the firearms useless, lacquering, polishing, and staining the guns until they resemble imposing sculptures hanging on the gallery's walls like benign canvases. is opening April 30th, 2015 at the Hoerle-Guggenheim Gallery located at 527 West 23rd Street, New York, NY 10011. 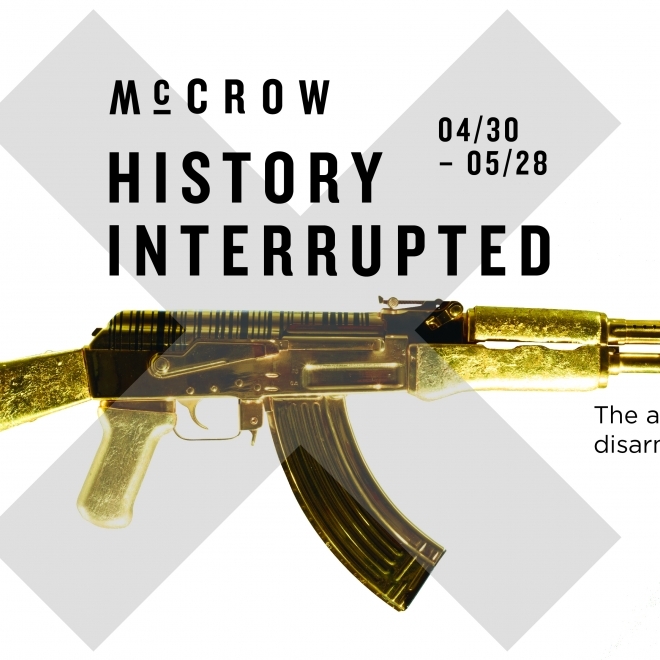 The show, which will be open to the public through May 28th, features McCrow’s latest work from weaponry procured directly from areas of conflict and then decommissioned. 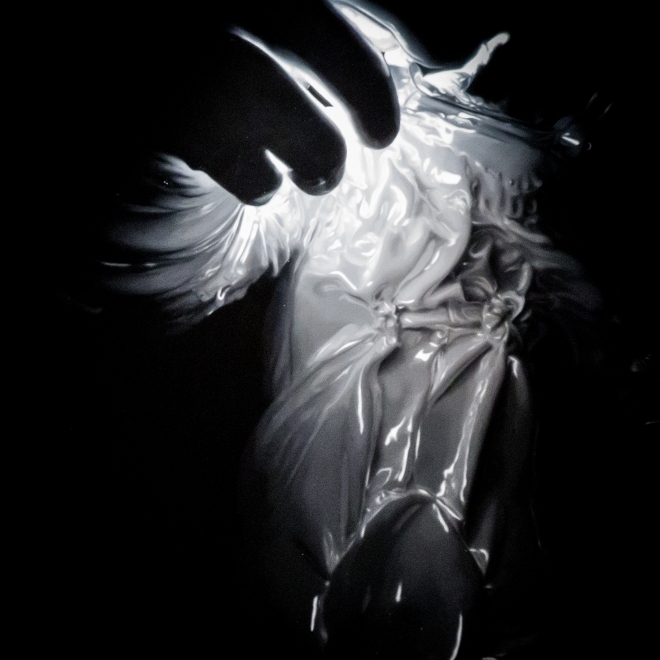 McCrow wants people to look beyond their new representation, to acknowledge the dark story each weapon carries with it; to challenge our sanitised view of guns, our reaction to their being in front of us and with that of our own morality. Saiers, who received his Ph.D. in mathematics at the ripe age of 23, pursued a successful career at Deutsche Bank before becoming chief investment officer of his own financial firm. 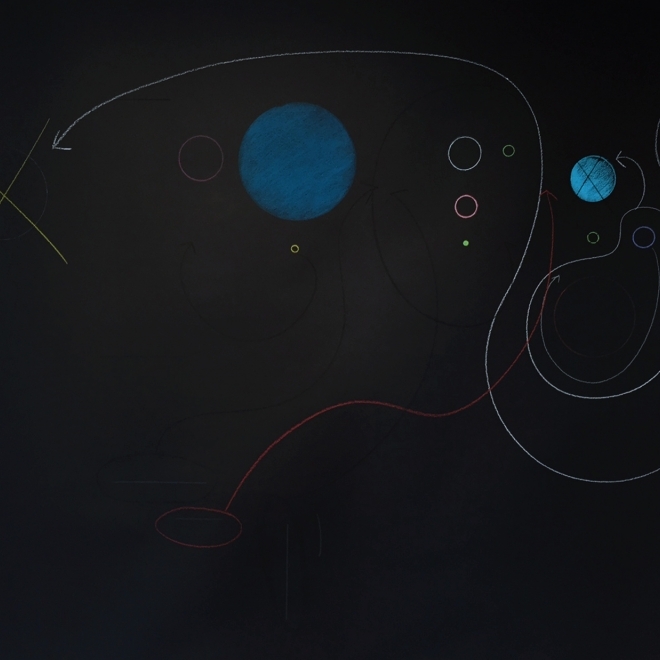 Now, the self-anointed “mathematical artist" has harmoniously transitioned fromalgebraic topology to painting. 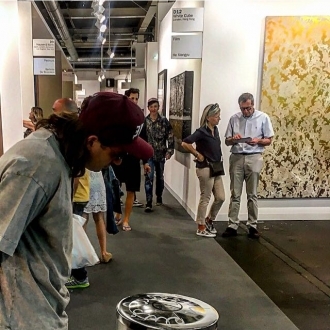 “The Original Art Basel” by Nelson Saiers. 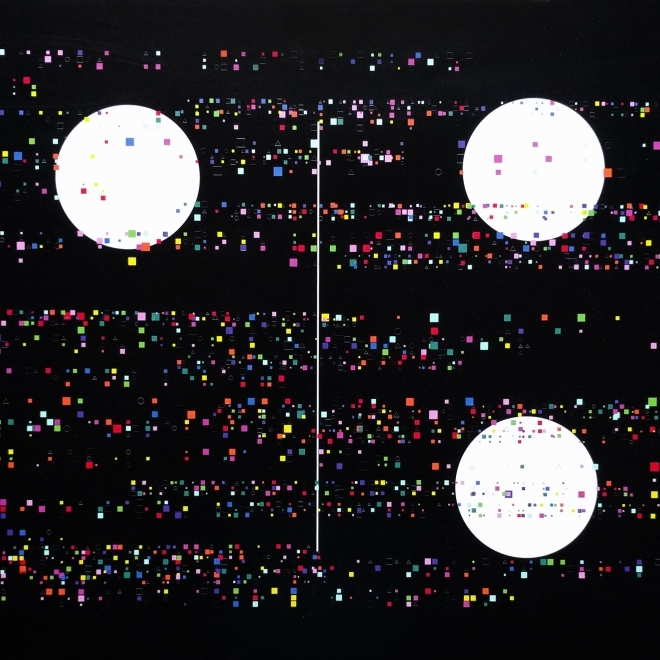 In anticipation of a very special π (Pi) Day, artist and mathematician, Nelson Saiers, has prepared dual pop-up exhibitions focused on this ubiquitous number. The doors for both will open Saturday, March 14, 2015, or 3.14.15, at 9:26 AM (that is, 3.1415926, or the first eight digits of π) at the Hoerle-Guggenheim Gallery, 527 West 23rd Street in Chelsea to celebrate this unique occurrence in the modern calendar. This exhibition will include an exclusive preview of Saiers' latest work. 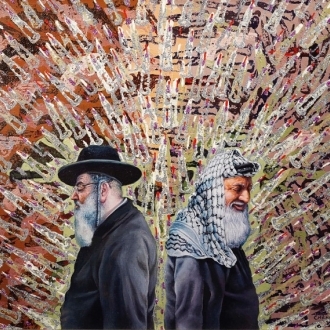 Saiers uses some of the most profound Pi-related equations and theories, combined with social commentary, history, and literature, to create visually-stimulating and thought-provoking works of art. 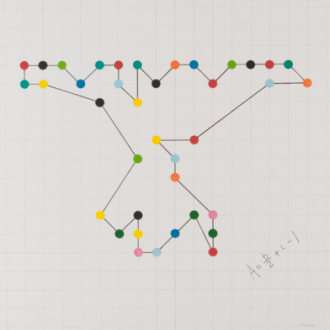 Inspired by Newton’s childlike view of himself, Saiers recalled his earliest discovery of math and created much of this collection with crayon and construction paper. 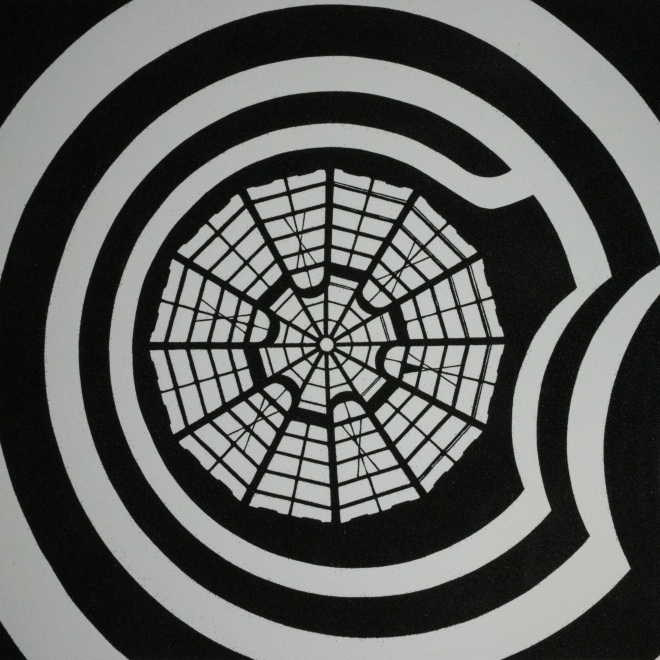 The abstract forms share the beauty of mathematical simplicity, but also take the viewer on a journey to explore the famously irrational number that defines circles and is fundamental to statistics, fractals, thermodynamics, mechanics, and electromagnetism. Philippe Hoerle-Guggenheim, the director of Chelsea gallery Hoerle-Guggenheim, has acquired an impressive array of important modern and contemporary artists for a gallery as young as his—it opened its doors on West 23rd Street for the very first time early this Fall. 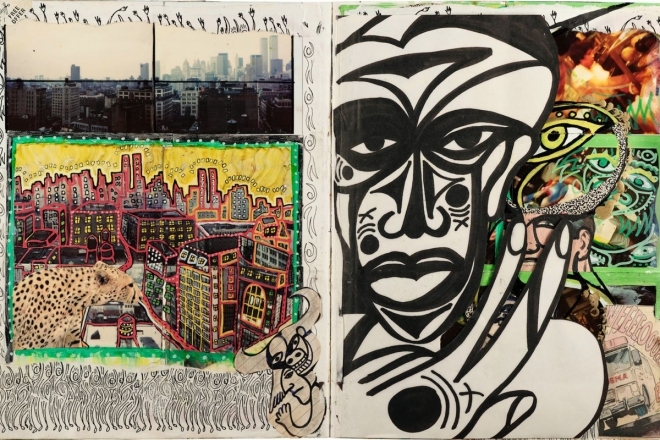 The gallery's most recent acquisitions include seminal works by artists RETNA. Also of note in the collection are the rich color-laden canvases of Natvar Bhavsar as well as a few choice works by Warhol, John Lennon, and Dalí. 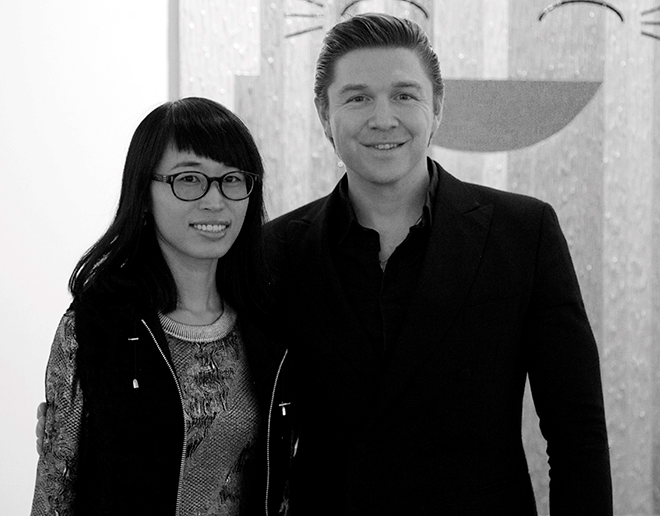 The Hoerle-Guggenheim Gallery marked its opening in style with a beautifully curated Chinese New Year celebration. The festivities included a traditional dragon dance set against the backdrop of expansive RETNA canvases, and a dinner with fortune cookies. 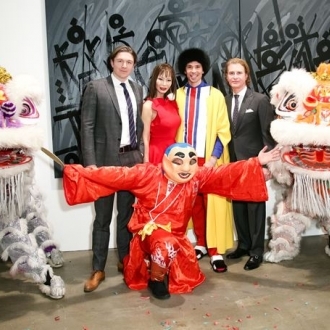 Gallery director Philippe Hoerle-Guggenheim and NY Projects president Yung Hee Kim greeted guests to this Chinese carnival, which was stylized by New York fashion icon Di Mondo. Inspired from a young age on trips to the Staatsgalerie Stuttgart near his home of Ostfildern, Germany, Tim started imitating drawings of artists like Cy Twombly and Kandinsky from the age of 9. 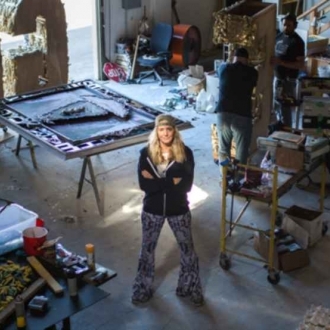 He developed his method of using sand, gold and glue between 2014 and 2015 before becoming a YouTube sensation by sharing videos of his process leading up to dramatic conclusions where he would reveal his intricate images by letting the un-glued sand and gold fall from canvases when turned vertical.